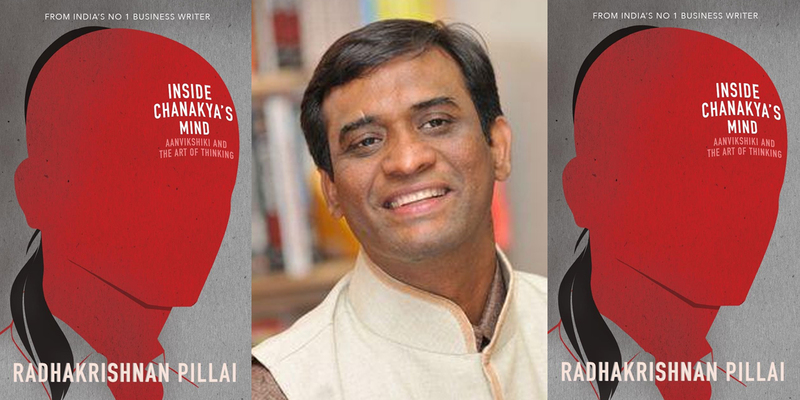 Author Radhakrishnan Pillai looks at the greatest strategist from a different perspective. The relevance of Chanakya to today’s world has only recently received the kind of attention it deserves. Radhakrishnan Pillai’s, Chanakya’s 7 Secrets of Leadership, co-authored with D Sivanandhan, was perhaps the first mainstream bestseller in this genre. The author’s latest book in the series, Inside Chanakya’s Mind, provides many more insights into the mind and thinking of the greatest strategist in the last two thousand years and more. The author calls it “the science of thinking” and the book is centered on exactly that — the science of thinking. It is, however, not a dry philosophical or scientific text. It is a management book. It is also a psychology book. It is, as the sub-title of the book itself says, about the Art of Thinking. Interestingly, the author also tells us that Aanvikshiki was one of the names of Droupadi. The very first chapter of Kautilya’s Arthashastra is called “Aanvikshiki Sthapana“. This should give you an idea of the importance Chanakya placed on Aanvikshiki. Chanakya (Kautilya), was a “master of many sciences, and the master of many kings.” If the wisest and shrewdest-ever practitioner of statecraft since Krishna thought it fit to place so much emphasis on Aanvikshiki, it stands to reason, what he had to say on the topic, should be of immense interest and relevance even today. It is around this concept and Chanakya’s writings, that the author, Radhakrishnan Pillai, has built the book. According to the author, practising Aanvikshiki requires one to consider three things: Good and evil (according to Vedic tradition — trai), material gain or loss (according to economics — vaarta) and good policy and bad policy (according to the science of politics — dandaniti). Dr Pillai then gets the reader started on the path of building these thinking skills, each chapter focusing on a different aspect of thinking — “Types of Thinking,” “The Different Models of Thinking,” “The Seven Dimensions of Thinking,” “The Eighth Dimension of Thinking,” and so on. Why is this insightful? If you know your Hindu texts, then you would know that Shukra was the guru of the asuras and Brihaspati, the preceptor of the devas. So, not only did Chanakya exhort readers to look at both sides of an issue, he also went ahead and named Shukra first — a call to first examine the “counter view first and then the good side.” This was the sage, practical and timeless advice from a master two-and-a-half thousand years ago. Take an example. If you, as the CEO, are contemplating a merger, think of how the target company would look at the acquisition. Consider how your biggest competitor would view this acquisition. Would they tacitly encourage it? A bad sign. Would they go after the target company themselves? What are the arguments against the acquisition? Then, consider the reasons in favour of the acquisition. How do you ascertain the integrity of your trusted employees? Chanakya prescribed four tests — the test of loyalty, the test of lust, the test of fear, and the test of material gain. Yes, loyalty is indeed an important facet of business strategy. For some leaders, loyalty is sometimes the overriding and the only aspect that matters. That is possibly a mistake. The four tests, however, would be relevant to almost any modern-day organisation. If you are talking of strategy and Chanakya, then talk of chess cannot be far behind. Sure enough, Chanakya, in book ten of the Arthashastra, talks of chess in the context of war. Business is war by another name, and while war in ancient times had chariots, horses, elephants, and soldiers, if you consider these as metaphors for resources in today’s world, then business strategy is all about the optimal utilisation of these resources. I felt this section was worthy of a lengthier exposition. In fact, there is a whole book lurking in this metaphor. What do you take elephants to represent — your cash reserves, your most profitable business unit, your patents, or something else? How do you position these “elephants” against an adversary? How did a Microsoft position its elephants against a Google? How did Maruti position its resources when faced with a resurgent Hyundai a decade ago? Perhaps, this is an idea for a future book that Dr. Pillai may write. In closing, I liked the book, and I will recommend it. I want it to become a success, to be read by as many people as possible. It is an important book on an important topic, and with a very Indian context. But, I felt the book missed at least two ingredients required for making it successful and sticky. “Sticky”, as in making the book “understandable, memorable, and effective in changing thought or behavior.” The Heath brothers outlined the formula for stickiness as one that followed SUCCESs in their blockbuster bestseller, Made to Stick — Simple, Unexpected, Concrete, Credible, Unexpected, and Stories. Anecdotes and concrete examples would have elevated this book from good to great. The “stories” part was missing. On the other hand, the book allowed me to view Chanakya from a different perspective. It provided insights, that I, or almost any other lay reader, may not have had without reading the complete Arthashastra. Even with a reading of the Arthashastra, I would probably have been unable to extract the same insights as the author did without having to spend considerable time reflecting on the text. The author, Radhakrishnan Pillai, has done all that for us. — Abhinav Agarwal. Son. Husband. Father. Technology. Software. Management. IIM-B gold medalist. Views expressed are personal.